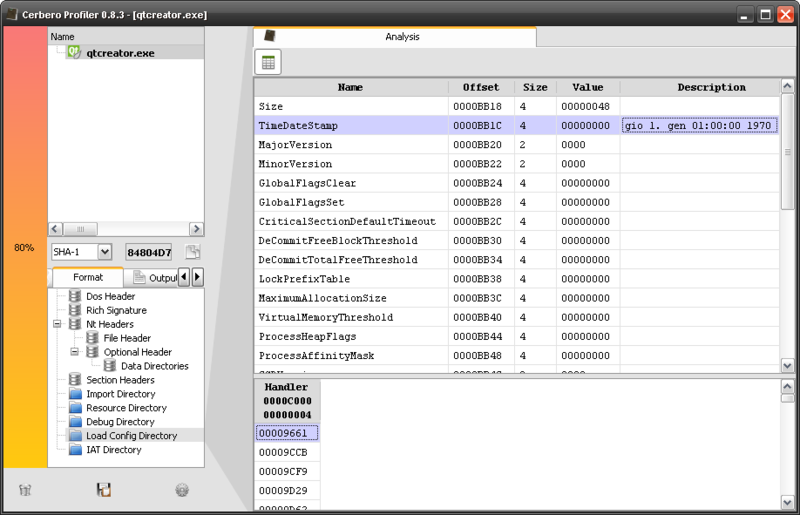 The upcoming 0.8.3 version of the Profiler features two new directories. Most of the work went into implementing an efficient model view controller for the Resource Directory tree. Last year I was notified by Ange Albertini that his resourceloop.exe sample crashed the CFF Explorer (by exhausting the stack). Recursion is one of the things to look after when parsing a file as mentioned in my speech about the security of non-executable files. 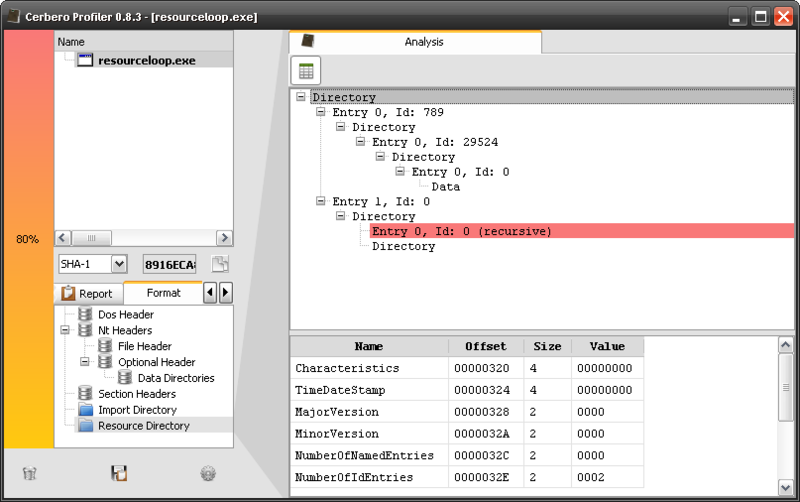 The screenshot below shows Ange’s sample in the Profiler. The red marked Resource Directory Entry points back to the top-level Resource Directory and thus creates a recursion in the tree. The Profiler is intended to offer complete support for the PE file format, this is why all directories will be supported. One of the directories missing in the CFF Explorer, for instance, is the Load Config (alias SafeSEH). Another small addition is the smart address converter (VA/RVA/Offset). This action guesses the address which needs to be converted from the context. Jumping to a location in the hex view is usually a matter of Ctrl+R and twice Ctrl+Enter. Five directories are still missing: Security, Exception, Bound Import, Delay Import and .NET. The analysis of x86 PEs can already be implemented by adding basic support for the Security Directory. x64 needs Exception as well. Bound and Delay Import support will follow. .NET is the one which has least priority, but it won’t take much time to impelement.